Disposing of unwanted material is a regular part of life, in Boston or anywhere else in the world. However, it’s something that many of us still take for granted. We throw things out all the time, but we don’t often think about the logistics of waste disposal unless we have to do so. That’s understandable—after all, dealing with junk is never pleasant, and why would any of us spend time thinking about unpleasant tasks unless it’s required? However, we occasionally run into situations where merely throwing unwanted items in the trash won’t be enough, and when we do, it’s important to have strategies in place to remove the unwanted material effectively. For many projects, the obvious waste removal solution is renting a dumpster in Boston to fill with your junk. Dumpster rental in Boston is an excellent way for people to rid themselves of their unwanted items. However, it is always best to do some research before you decide what will work for your waste disposal needs. If you are one of the many people in Boston who has never needed a dumpster before, there are probably some rules of which you are not yet aware. Learning more about the process can provide you with the information you need to make an informed choice, and can help you obtain the best results from your rental if that is the option you choose. Renting a dumpster to dispose of your unwanted material is not the only option that Boston residents have. There are in fact several other ways in which to dispose of waste, depending on your circumstances. The question is whether any of these methods will match dumpster rental for convenience and cost-effectiveness. Conventional alternatives include full-service junk-removal services and DIY strategies such as moving items to the landfill in one’s own vehicle. Full-service junk-removal companies can seem like the most convenient option at first because you don’t necessarily have to move any material by yourself. However, the price of these services can be prohibitive to some Boston residents, and they can be challenging to schedule properly. Hiring a junk removal company means that you should be around to let them onto your property when they arrive. On the other hand, dumpster rental allows you to work around other important events in your life instead of putting them off to deal with waste. For this reason, self-service dumpster rental is considered to be a much more convenient strategy than hiring a full-service junk removal company. It is also more sanitary and lower-risk than taking the waste material to a landfill by yourself. When you hire a dumpster, the rental company picks it up for you and disposes of the contents. It is important to note that dumpsters rented in Boston are subject to specific state-wide regulations that prohibit specific materials. Before you decide to rent a dumpster for your waste removal needs, you should make sure that the materials you are trying to have removed are suitable for the container in question. Some items are prohibited because they are toxic or dangerous to the surrounding environment, while others may pose safety hazards to passersby in the neighborhood. Understanding the items that are not allowed in dumpsters ahead of time can prevent having to pay fines or face other penalties. The following items are considered waste ban items in MA and will result in handling charges from any transfer and recycling operation in the state. Some items may be prohibited entirely, such as explosive or corrosive substances, and highly flammable materials. Understanding these restrictions completely is necessary, so it usually is best to contact an experienced junk removal company and seek clarification if you are unsure about anything you want to place in a rented dumpster. Some companies charge you based on the length of time that you want to rent the unit for, so it is critical that you make sure to check beforehand. There are two ways to avoid paying hefty costs for a long rental: you can either set clear terms up front or use a company that doesn’t base their fees on the length of time for which you are renting. Other companies may charge you based on factors such as the amount of space you use within the dumpster itself. These companies may prove to be more cost-effective for some Boston residents. Renting a dumpster can be a convenient way to achieve flexibility and control in your waste disposal efforts, but it comes with one extremely vital responsibility for the renter: where do you have the dumpster placed so that you can fill it? Unbeknownst to many Bostonians, you can’t just put the container anywhere. For one thing, it must be located on your property, so city streets and other public right of way areas aren’t going to work. You will also have to make sure that you place it in an area that will be easily accessible when the rental company comes to collect it again. If they are unable to reach it at the end of your rental period, they may have to try again later, and charge a fee. In addition to the physical and logistical considerations you will face when renting a dumpster, you should also think about the company from which you hire. Will you choose one that charges by the day, the weight of the container upon collection or the amount of space that you use? Most people find the last option to be the most convenient since it allows them to save money by packing their unit efficiently. That’s why at Junk King, we only charge based on the amount of space used in each of our rental dumpsters. We also offer conveniently-sized mini dumpsters that can be left in driveways to facilitate easy drop-offs and pick-ups. Consider the above information whenever you are considering the rental of a dumpster in Boston. Once you do, you should be able to make an informed decision and hire a container that suits your waste removal needs perfectly. 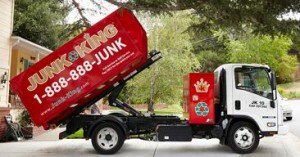 For more information on a dumpster rental in Boston, MA, contact Junk King directly and speak to a qualified member of our staff. We will be happy to answer your questions or to help you schedule a rental for one of our convenient mini-dumpsters shortly. This entry was posted in Uncategorized and tagged junk haulers, Junk King, Junk King Removal on October 10, 2017 by Julian Torres, "JT". Last updated January 21, 2018 .